Sometimes it is desirable to redirect Exchange Email OST files from the default location of C:\Users\%username%\AppData\Local\Microsoft\Outlook\OSTFile.ost to a network location such as N:\MyOutlookFiles\OSTFile.ost. 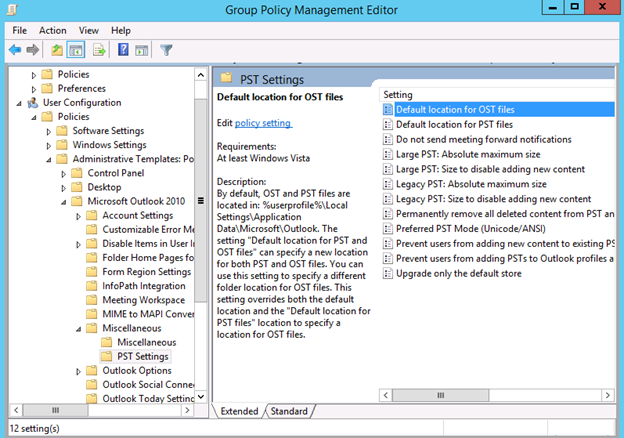 In this guide I will show you how to redirect OST file to a mapped drive using GPO. To use GPO to redirect Microsoft Exchange OST file to a network location, we need to install Office 2010 AMDX. It can be found here. After downloading the file, double-click it to extract the contents to C:\AMDX on your Windows 2012 R2 server. The installation process will automatically start after the extraction takes place. Now launch gpmc.msc (Group Policy Management Console). You will find the settings under User Configurations, Policies, Administrative Templates, Microsoft Outlook 2010, Miscellaneous, PST Settings. You can see two important Settings here. They are “Default location for OST files” and “Default location fo PST files” which you can enable and set the network drive for them such as N:\MyOutlookFiles.